On Wednesday 27th of November, 6 members of staff set out to take part in the charity event I’m a teacher get me out of here. 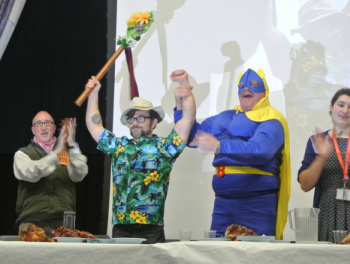 Amongst those participants, Mr Belas, an English teacher, managed to triumph in the competition and help raise money from the tickets sold to the students. The event was cleverly organised by Mrs McElligot as she knew that students wanted to witness their fellow teachers eat disgusting things. Even though, Mr Belas felt fairly confident on the lead up to the event, in contrast there was some doubt from others. The apprehensiveness present was due to Mr Belas becoming ill previous weeks before and unfortunately having to drop out the 1st round of I’m a teacher get me out of here. In order to prove to those who were in doubt that he was as ready as ever, he had to eat disgusting parts of animals. In the event he ate various things from pig’s snout, sheep’s testicle, pigs eyeball to cockroaches. Despite all of these things being the complete antithesis of delicious, Mr Belas ate it all without any faults. Mr Belas didn’t feel anything when eating any of them-“some just tasted of meat; nothing was completely vile,” he told the Pulse. Before Mr Belas became victorious, he had to go against 5 other members of staff, who were also hungry for the win. The other participants included: Mr Hal, Ms Vines, Ms Hinds, Jeff/banana man and Ms Pastor. Amongst all of those teachers, the one who became Mr Belas’ main competition was Mr Hough. Towards the end of the event Mr Hough proved to be quite a threat to the fellow English teacher. “I didn’t win by a mile; Mr Hough was there right behind me every step of the way,” Mr Belas said. Reflecting back on the event, the Pulse also asked Mr Belas how he felt afterwards. In response he surprisingly commented that he was fine and had no sickness feelings. “I was fine but needed a mint to erase the taste.” In fact the after taste was so unpleasant Mr Belas compared his bad breath to the taste of dog food. That pretty much summed up the taste in his mouth to be quite disgusting. All with the immediate feeling comes with how you are feeling later, which Mr Belas was expecting to be bad. To his surprise, later on and days after, he felt healthy as ever. “I thought I would become ill again as my body was quite vulnerable weeks before and I didn’t know if my body had fully recovered,” he told the Pulse. After Mr Belas’ triumph in the school charity event he was asked if he would participate in the event again next year. “Yes, it is not a problem; it is for a good cause.” As Chingford Foundation School is strongly involved in charities, he moreover said that if he was asked to do anything for charity he would do it as he doesn’t want to let the school down. Overall, Mrs McElligot raised around £500; it was a great success. watch the exclusive highlights video!